I do like to change things up a bit now and then, but I often just pick up something that catches my eye. 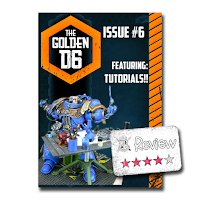 This week's Frugal GM Review is something different that piqued my interest: a preview of a Zine called The Golden D6 #6 from Sprue Grey Toy Soldiers. The preview is 9 pages and free, but the Zine itself is 55 pages and $4.54. I'm wondering if the odd price is due to some conversions from US Dollars to Australian Dollars. I'm not quite sure where I picked up the idea that this was an Aussie product*, but since this review is on the freebie that aside really isn't that important. This preview is basically one article taken straight out of the Zine and that article is "How to Clean and Maintain an Airbrush". I do have an airbrush that I've never used, largely because I'm a bit intimidated by it. I have no clue how to use it, much less take care of it, so this article is quite appealing to me. One thing I really liked is that there is a little bit more to the article than I expected in that the author goes into cleaning between colors as well as post-painting cleanup. There is also a little bit of troubleshooting as well. Overall this article is much better than the instructions I received with my airbrush and now it doesn't seem so intimidating. Ok, that is my going off on a tangent there. The PDF preview is not secured, and it doesn't have any of the PDF properties filled out either. The latter isn't as big of a deal as it could be because there are some working hotlinks to the publisher's website. 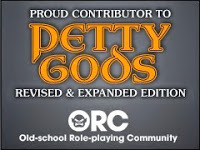 The PDF is sized A4, so it won't come out quite as good squeezed to US Letter size, but again, not a big deal. Overall I liked this preview from The Golden D6 #6 about airbrush maintenance and I think the download does a good job hinting at the quality of the parent Zine, which is important for a pre-view. Looking at the included table of contents, I think I'd like to pick up the entire Zine because I think I'd find it useful. *Found it! The fine print in the Sprue Grey logo says "Melbourne Australia"